You have now reached the point where you are going to use for the first time your 3D printer. The power supply is properly setup for your power grid voltage (220V / 110V) => check that the side switch on the power supply is set to the proper input voltage. All the motors must be connected to the proper electronic terminals. The Z axis motors connectors should be connected the same way, the 4 colors wires must be oriented the same way. For a single hot end 3D printer, you must have only 4 Stepper driver (with the small heat sink) connected! We provide 1 extra driver as a spare part, or to be used for a 2nd extruder. . It’s important to note than the spare Stepper driver must only be connected to the electronic board if a stepper motor is attached to it! Otherwise you will kill it. Check that all the end stops are connected to the proper pins. On the Ramps electronic board, for the end stops, you will see 3 rows of pins. The first row corresponds to the +5V. The second row is the Ground , and the 3rd row is the signal. End stops are simple switches, if you connect the +5V with the 0V ground row, you will short circuit the +5V volt coming from the Arduino board and kill it’s regulator. Once all those points checked, you are ready to power on your machine. Press the knob button on the LCD and a sub menu will show up displaying the basic functionalities. We are going to check that the stepper motor wires are connected the proper way. Go into the menu « Prepare ». Push the knob once. than navigate down to the « Move » item. Push again the knob. The following menu is displayed asking for what type of move to perform.. Chose « Move 1mm » . This gives you the ability to see all the axis to move. After that you will need to choose what axis to perform the move to. Start with the X Axis. Push the knob and yet another sub menu is displayed.Turn the know right or left in order to increment or decrement the value and to move you axis right or left.Push the knob to come back to the previous sub menu. Regarding your 3D printer, the end stop position gives you the initial 0 position. So incrementing the X axis value must move the axis away from the end stop. Decrementing the value must move the axis toward the end stop. If the axis is moving properly, you can skip to the next step. Otherwise, if the axis doesn’t move the proper way you will need to turn the stepper motor connector..
You must power down the 3D printer before doing this step in order to protect your stepper drivers. Otherwise you might kill them. Switch down the power supply of your 3D printer. On your Ramps board, look for the X axis stepper motor connector and invert it. In principle, if the wiring stays the same, the red wire must be placed toward the right of the board, as you can see on this picture. This process is valid whatever the stepper motor manufacturer if they provide a 4 pin connector with the proper wiring. Follow the same previous steps to move your x axis motor and check that it move the proper direction now. If the stepper motor is only moving in 1 direction, check that the end stop is connected to the proper terminal and also check that the end stop wires are still intact. Often, when a stepper motor seems to behave randomly, it might come from a false contact on one of the end stop wire. For the Z axis, as 2 stepper motors are connected to the same stepper driver, you need to make sure that both are connected with the wire colors aligned the same way. If everything goes well, the hot end should move up and down accordingly and both or your motors must move in the same direction. If you invert one of your stepper motor cable, one side should go up, while the other side of your Z axis will go down. You must make sure that at least both motors move on the same direction before going any further. For the Z axis, when the Hot end is going up, it correspond to a « positive » move. When it’s going down, then it’s a « negative » move. A small red led on top of it should lid up when the metallic object is placed underneath the probe blue tip. If the led is lit up, it’s a good sign and you can continue . If the led stay off, then you will need to make sure the +12V power cable from the probe is properly connected to the +12V of the power supply. There might be a false contact at this level. Also the ground cable might be connected on the wrong pin. The probe wire has 1 cable with 2 wires, 1 black and 1 green. The black one is the GROUND (+0V) wire.If it’s connected to something else than a ground pin, the probe won’t work. Now you are going to adjust the height of your inductive probe with your hot end nozzle. There are many techniques, but here is one. You need to manually (using the LCD screen) lower down the hot end so that the hot end nozzle is touching the heat bed surface. The lower down the inductive probe. Lower it down so that it touches the aluminum plate. 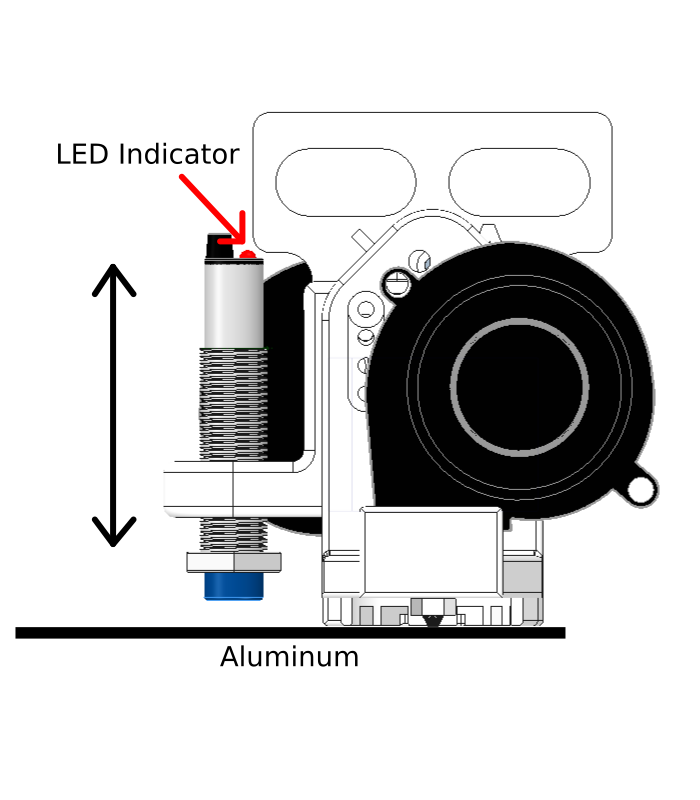 Here the led indicator should be ON. Now move up of only 1 or 2mm the probe.You will be able to configure the firmware later on to handle the offset between the probe and the nozzle tip. Then secure the inductive probe using the 2 nuts. You can use some paper glue/varnish/etc… over the holding nuts in order to prevent them from moving with vibrations..
Now you can test the « Auto homing » feature. It allows to initialize all the axis of your machine and to place the inductive probe at the middle of your print area. 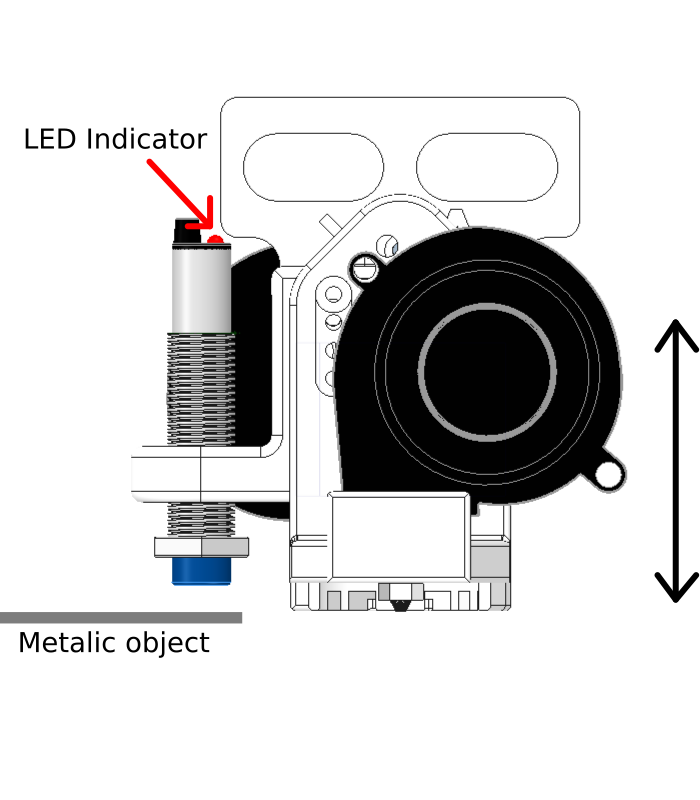 Before anything, make sure you move up the Z axis of about 10mm using the LCD display. to prevent any issues when performing the « auto homing ». If the hot end’s nozzle is too low it can damage the surface of your aluminum heatbed. Warning: For this first test prepare yourself to shut down the power supply of your printer if the hot end is going too low and is crashing into the heatbed surface.. If everything goes well, the machine will move on X axis first and then on Y axis.. The the hot end will slightly go up and move to the center on the print surface.The it will lower down until the inductive probe led is witched on. At this moment it will slightly go up again, and perform another probing point much slower.. In order to adjust ZOffset, you will need to print a calibration plastic part, and adjust recursively the offset so that the beginning of the print is at the proper height. Depending on the firmwares you will need to reload the parameters after saving them in order to make sure you are using those. Depending on the firmware version the behavior might change but here is the current behavior.. This parameter tells the machine the offset between the nozzle tip and the inductive probe detection point. The inductive probes can detect metal with different sensibility. The one provided here has a sensing capability of about 4mm. The Z offset value will tell the machine how much it needs to lower down once the inductive probe has detected the aluminum plate.. The inductive probe should always be higher than the nozzle tip. Inside Cura you will need to load a calibration part to print. Then save the generated Gcode into your SD card, We are going to use this Gcode in order to adjust ZOffset. Print this part using the LCD screen of your printer. Make sure you stay close to your printer ready to shut it down on any issues. The machien should perform Auto Hom and place the probe in the middle of the print surface. Then it should probe the 4 corners of your print surface. If everything goes well, your print should start too high. it’s good sign and you have some margin to adjust ZOffset.If the printer start printing too low you will need to lower the inductive probe a little bit! Start a new print. Your nozzle should start 0.2mm lower than previously. repeat these operation by « increasing » the ZOffset value until the print start at the proper height and that the plastic will properly stick to the Kapton tape without damaging it. If you are damaging the Kapton tape then you are too low and you will need to decrease the Zoffset value. Save your parameters into the electronic memory. Into the main menu, you will find the » Store Memory » menu. All the parameters that you can change with the LCD will be stored into the internal memory of your electronics. 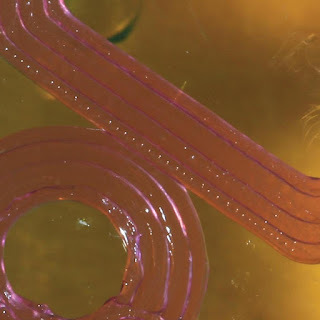 When you are going to perform your first print, you will need to check that the nozzle tip is printing at the proper height..
Too low and you are going to scratch the print surface damaging the kapton tape or even the aluminum surface. Too high and you will print in the air or the plastic part might detach itself during the print.. If the nozzle is too high , you will need to increase the « Z offset » value .Using a 0.1mm step increment can be a good idea at the beginning. You might need to perform several tests at first to narrow down the proper value. If your nozzle is too low, you will need to decrease the « Z Offset » value. A 0.2mm step is a good idea! I am at the proper heigth? With experience you will know when it’s OK. However the following points might help you determine if you are ok. When printing your first layer, if the layers don’t stick together, and there is some space between them, it means that you are slightly too high. Increasing the « Z offset value of about 0.05 or 0.1mm will help you to fix this state. If you are too low, some full metal hot ends such as E3D or AllInOne will get jammed because the melting plastic pressure will go up into the hot end and will expand. If this happens you need to remove the PTFE tube and pull the plastic out of the hot end. Then cut the plastic end and place it back inside the hot end. Then decrease the « Z offset » value of about 0.1mm. Example of a correct first printing layer. The layers are slightly smashed down and there are no spacing between them. Cette entrée a été publiée dans Non classé le 28 September 2015 par Nicolas Rambaud.